Growing up in Sweden, Per Bristow was a prodigy violin player, the youngest ever invited into the city’s symphony orchestra at only 12 years old. Instead of music, however, Per opted to pursue sports during his teens. During this time, after a back injury, he learned some principles that helped him to learn rapidly, such as advanced kinesthetic awareness, mental imagery and visualization techniques, understanding and appying the physical law of least effort, the application of flow and rhythm and an ability to enter a state of “peak performance”. Only two years later, he was a top athlete in the nation in track and field. He began singing and acting, becoming a top performer, as the original rock cat Rum Tum Tugger in the musical Cats – a production that was recognized as one of the top Cats productions in the world, starred in West Side Story as Riff for 350 performance, has sung the role of Jesus in Jesus Christ Superstar, sang in rock band, choruses, jazz groups and has had many roles in TV shows and feature films. Also, as creator of The Bristow Voice Method, Per has empowered tens of thousands of singers and speakers from over 132 nations to heal, build and free their voices. The Bristow Voice Method was born out of Per’s vast experience as a performing musician, singer, actor and athlete, his many years of experience as a teacher and coach, and his depth of knowledge in areas of human anatomy, modern training methods, advanced learning strategies, peak performance psychology, advanced mental training techniques, nutrition and more. 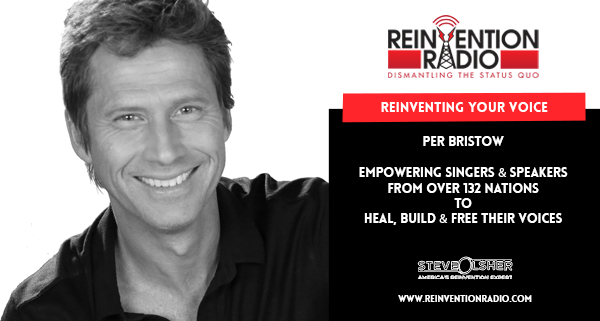 TUNE IN to this episode as Per chats with Steve, Mary and Richard about how he empowers singers and speakers from around the world to heal, build and free their voices. Reinventing Resilience – In this episode, Izzy Ezagui chats with Mary and Richard about resilience and how he battled back after losing his arm to return to the battlefield and combat. Didn’t the host want to hear what Per had to say? The program had so many conflicting voices and interruptions that it was very hard to listen to. Thanks for taking the time to listen and comment. Reinvention Radio is a little different than most other podcasts you may listen to. It’s a live radio show with multiple hosts so it’s very interactive, and a little morning zoo-ish. We hope you’ll listen to other shows and become a fan!